Digital India as we all know emerged as an initiative by the Government of India to bring the Government services electronically accessible to the citizens. It is a venture for improving the online infrastructure by increasing Internet connectivity. 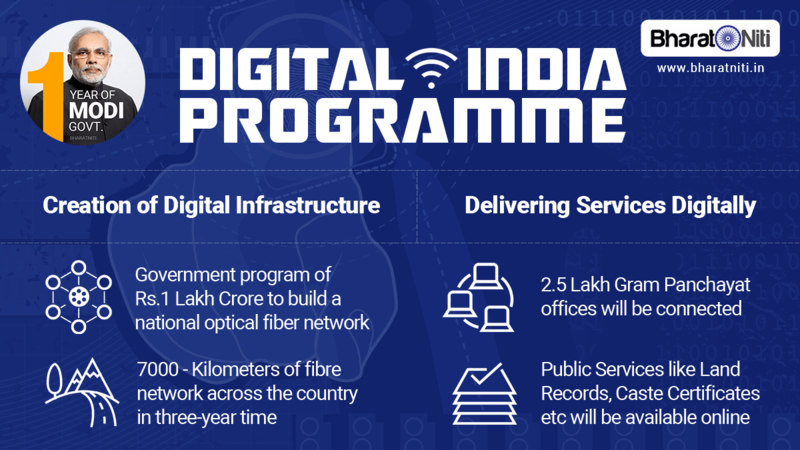 Launched on July 1, 2015 by Prime Minister Narendra Modi, the initiative has chalked out a route map of connecting the Rural India with a strong and close network of high-speed internet services. Digital India has pushed Indian Citizens to a sort of craze manifesting the hopes and dreams coming true. The dream is obvious for everyone where one wishes to feel proud of his own country which would be free from negativity and won't throw constant threats to its inhabitants with its corruption, social injustice and criminal practices. Digital Technologies of Digital India will include Cloud Computing and Mobile Applications as the main catalysts responsible for the rapid economic growth and citizen empowerment spreading across the globe. 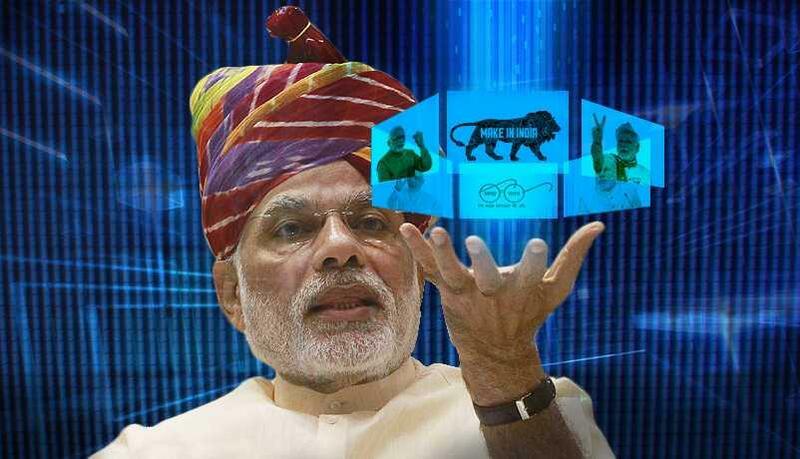 The overall cost of Digital India is approximately showing a figure of Rs. 100,000 Cr and about Rs. 13,0000 Cr is required for the new schemes and to run the ongoing activities. The Corporate sector has proposed to invest around Rs 4.5 lakh crore in the initiative. So are we all ready to hope for the best and prepare for the worst? The objective of the Digital India Group is to encourage the youth of India with innovative ideas and come up with practical solutions to solve the issues currently India is facing. Prime Minister Modi had the vision to transform the nation he is in charge of by creating newer opportunities for its citizens with the help of digital technologies. The idea behind this project is to empower each and every citizen of India with accessibility to the digital services, and update their knowledge ensuring their "right to information". This Group is instructed to come up with innovative policies and become a guide and monitor for the best practices from the different corners of the world and help shaping this biggest project of Digital India into a vibrant reality. It is said that it will be a bilateral platform where both the service providers and their consumers would be benefited. 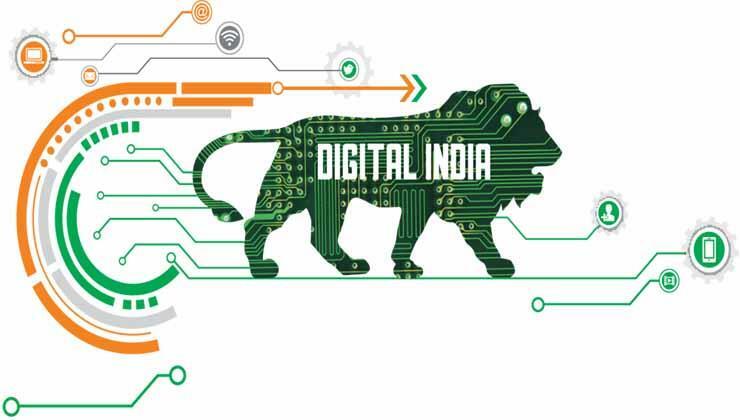 The Digital India Advisory group has been given the responsibility to monitor the scheme and control it while the initiative will be chaired by the Ministry of Communications and IT. As a well integrated project Digital India is likely to take the shape of an Inter-Ministerial initiative wherein all the departments of ministries like Education, Healthcare, Judicial services and others will come up with their own contribution of services to the people of India. The model will be that of a Public–Private partnership and each of their actions would be adopted after a rigorous scrutiny. Moreover there are future designs to to restructure the National Informatics Centre to establish the Information Service as one of the top priorities of the Government. There are some facilities which are known to be extended through this initiative and among them few are like E-education, E-health, E-sign, Digital Locker and the National Scholarship portal. A launching of Botnet cleaning centers is also on the offing. The concept of Digital Locker came up with the idea of helping citizens to digitally store their important documents like Voter ID, Aadhaar Card, PAN card, Passport, Mark Sheets, Certificates etc. It is to ensure a secure access of the public to the Government issued documents. Aimed at reducing the use of physical documents and introducing the trend of sharing of verified electronic documents across different government agencies has no doubt shown a brighter and modern pathway towards growth and sensibility. Launched on 1 July 2015 by PM Narendra Modi, the website of Digital India promised to maintain a real-time based record of the attendance for the Government employees. This was effective with the implementation of a common Biometric Attendance System (BAS) introduced in the central government offices which are located in Delhi. The launch of Digital India was equally dramatic as the speech of our honorable Prime Minster Narendra Modi. A lot of eyebrows raised with the proposal, the idea and also with the expectations and anticipations, regarding how the entire project will fare. No doubt it will bring about changes with which the general Indian mentality was not prepared. Especially it prominently goes against the "unwritten facilities" which the "babus" used to enjoy. And now when people could not be anymore harassed and allowed to mess around with their identity proofs and other documents, things would obviously not look smooth to many. It would be a Boon to the IT industry including small and big enterprises. Citizens would be given an open access to the government. This can grow into an immense possibility towards a solution to these issues as a natural process, as people who commit anything negative are afraid of being exposed, and this Digital Exposure would automatically prevent from negative things to happen. Will the Digital lockers work and not cause more inconvenience? How will the corporate sector recover their costs? Is it going to ask the people to share the burden through increased tax? 1. The business houses are anyway handling our personal data, as to some extent we have used all our data in some or other digital process, they are already out for "sale". The only way to take some precautionary step is to procure the physical documents safely with ourselves as we have done it so far. 2. It is possible that the Digital Lockers give some initial trouble or even come out unsuccessful, but for the good days to come, we can surely give it a try. 3. The corporate sector is not sitting idle anyway without spending. They are investing in advertisements, their promotions and for many other reasons, and there's no reason to think that we aren't already paying for them. So if they invest for some national benefit, won't it be more satisfying even if we have to pay for it? To take a step towards a betterment, we have to be brave enough to prepare ourselves for some teething problems. If we don't step forward, we remain back still and stagnant. When good ideas sprout, we need to welcome them without being too much skeptical or dependent on them. Please share your views and let us know what do you think on this National Initiative. PM Modi is doing nice work and I hope this new project will make a better connected India.